Well there has been a lot of search activity as of late and some very interesting developments. With the popularity of micro-blogging (see Twitter) and the ability to obtain information real time, internet speed is quickly changing the way we search. Real-time search is a hot topic out there right now and we are starting to see some of the big players roll out real-time search capabilities. On Twitter you can send information to the online world through 140 characters with one click. This information can quickly be read, absorbed and re-tweeted. (By the way did anyone happen to see the Teen Choice Awards yesterday where the gave away the award for "Choice Twit" - Ellen DeGeneres won for her tweet on why not to tweet about garbanzo beans... anyways I digress...). The fact is that Twitter helps communicate information is real-time (or very close to it). Now Facebook is looking to improve search by offering real-time search capabilities. The announcement of Facebook's real-time search comes following their big announcement about the acquisition of FriendFeed, which comes with its own real-time search engine. Perhaps to compete directly with Twitter? Here's a look at some of the discussion about Facebook's new improved search from the Facebook blog. "... to rank and return the most relevant pages for users' queries as quickly as possible." Sounds good to me. So what does this mean for real-time search? Well perhaps nothing right now, but the changes being made in Google's infrastructure are a step in the right direction in terms of returning quicker, more accurate results. 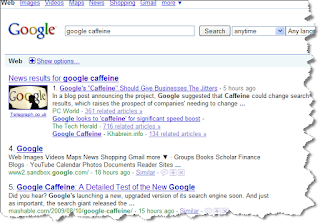 Early reviews of Google caffeine seem positive. The Caffeine update isn’t about making some UI changes here or there. Currently, even power users won’t notice much of a difference at all. This update is primarily under the hood: we’re rewriting the foundation of some of our infrastructure. But some of the search results do change, so we wanted to open up a preview so that power searchers and web developers could give us feedback. we can guess that this new infrastructure may include ways of crawling the web more comprehensively, determining reputation and authority (possibly beyond the link graph and what’s typically thought of as PageRank), and returning more relevant results more quickly, although Google’s Matt Cutts told me that the changes are “primarily in how we index”. So before all of you go out and try to figure out how to optimize your web sites, I would suggest addressing the fundamental site issues such as clean URL structure, relevant content, unique title and meta tags and proper interlinking etc, etc are still key. Or as Vanessa Fox states, "foundational elements of having a crawlable infrastructure and compelling content remain." Looking forward to some real-time searcing in the near future.